Kamchatka (Russian: Камча́тка, kahm-CHAT-kuh) is a 1,250km-long peninsula in the Russian Far East. Kamchatka is extremely geologically active and has numerous volcanoes, geysers, hot springs and even a lake of acid. It contains the southernmost expanse of arctic tundra in the world and is notable for its wealth of arctic wildlife, fish, game, and marine life. Nineteen of Kamchatka's volcanoes constitute the "Volcanoes of Kamchatka" UNESCO World Heritage Site, . Kamchatka's climate is diverse and comprises several climate zones, including alpine, coastal and geothermal climates. Summer and autumn months are the most popular among tourists when max temperatures range from 15°C to 30°C. The high season lasts from June to September. The weather is marine and very changeable. In summer temperatures can fall significantly at nights. Storms from the Okhotsk sea and the northern Pacific bring heavy rain. Mosquitoes may cause some discomfort in low altitudes and are active through summer until September. Summer temperatures are high enough to allow swimming in Avacha bay. Yelizovo — Only notable for hosting the only commercial airport on the peninsula. Palana — Capital of the northern Koryakia region of Kamchatka. Esso - center of dog-sled racing. Anavgai- nomad camp of Even people. Valley of the Geysers perhaps the most well known part of the UNESCO World Heritage site, Volcanoes of Kamchatka, and is located within the mammoth Kronotsky Nature Reserve, was the second largest geyser field in the world (and the only in Eurasia) with 90 geysers and many hot springs in a 6km-long valley. It was largely ruined by a massive, freak mudslide in 2007 that covered 2/3 of the territory. Koryaksky Zapovednik — beautiful and almost impossibly remote, this reserve offers bear-watching opportunities galore. Kamchatka is a unique land where fire meets ice, containing the southernmost expanse of Arctic tundra along with 160 volcanoes (29 of them active). Despite its great size, the peninsula is home to just 400,000 people, of which half live in Petropavlovsk-Kamchatsky and another 50-100k live in nearby communities (including Yelisovo). As such, the peninsula is a vast uninhabited wilderness where one can climb volcanoes, sport hunt for bears, visit geysers, spend hours in natural hot springs, or go fishing in wild rivers or off the coast. Politically, it is divided between Kamchatska Krai and Koryak Okrug (Koryakia). Kamchatka was, like much of arctic Siberia & North America, originally sparsely inhabited by native tribes. In the 16th century, spurred by tales of a land of fire, rich in fish & furs, Kamchatka was claimed by Muscovite Russia. Two settlements of Cossacks were built in 1697 as fur trading posts. The peninsula was mapped during Vitus Bering's expedition to explore the Far East of Russia and reach North America. In 1740, Bering reached Avacha Bay and laid the cornerstone for the settlement of Petropavlovsk — named after his two ships St.Peter & St.Paul. One year later, Petropavlovsk would be the settlement survivors of his expedition would reach with news of his death and the discovery of Alaska, as well as their remaining discoveries including the "finest fur in the world" (sea otter) from Alaska which would later spur Russian interest in North America. Petropavlovsk grew into a main stopping point for travelers to the Russian Far East, the Kuril Islands, and North America. In 1854 during the Crimean War, a joint Anglo-French naval fleet bombarded Petropavlovsk in what became the heroic defense of the city, in which 988 men with just 68 guns defended against 6 ships with 206 cannons and 2,540 French and British troops. Unfortunately the Russians decided the city was a liability, and when more invaders came a year later, the city was burnt and abandoned. With the sale of the Kurils to Japan and Alaska to the US, the peninsula waned in importance. Following World War II, it was deemed a military zone and placed off limits to Russian visitors until 1989 and foreigners until 1991. The peninsula hosts the largest Russian nuclear submarine pen & submarine construction yard. The most notable event since Petropavlovsk's defense in 1854 was the shootdown of Korean Airlines flight 007 in 1983 after it drifted off course and flew over sensitive military areas on Kamchatka, resulting in one of the most tense moments in the Cold War during the early-80s. There are no roads connecting Kamchatka with other parts of Russia. Indeed, Petropavlovsk-Kamchatsk is the second-largest city in the world which cannot be reached by road. Arriving by plane is the only practical way of reaching Kamchatka. All commercial flights arrive at Yelizovo, only 16km from Petropavlovsk-Kamchatsky/PKC (which airlines list as the destination). There are regular nonstop flights between Petropavlovsk-Kamchatsky and: Moscow (Aeroflot, Utair), Khabarovsk (S7, Aeroflot), Vladivostok (S7, Aeroflot) and Yakutsk (Yakutia Airlines, summer only). Regular direct (one-stop) fights and connecting flights are available between Petropavlovsk-Kamchatsky and: Moscow (Yakutia Airlines, S7), Saint Petersburg (S7), Novosibirsk (S7), and Irkutsk (S7). Yakutia Airlines provides seasonal summer service (July and August) from Petropavlovsk-Kamchatsky to Anchorage, Alaska, and the Japanese cities of Tokyo and Osaka. Heritage Expeditions  run 14 day expedition cruises from May - September every year, onboard the 50 berth expedition ship the Spirit of Enderby. Most expeditions depart from Petropavlovsk-Kamchatkiy and may include the Kamchatka Peninsula, the Commander Islands and further afield. Due to the lack of infrastructure and roading on the Peninsula, cruising provides a way to see parts of the peninsula that would be very difficult to see otherwise. Depending on the destination of your journey, there are Russian and Japanese jeeps available, as well as 6WD URAL and KAMAZ trucks which are equipped with booths for travellers. 4WD vehicles tend to be incapable of overcoming a majority of the dirt roads in this region, especially if snow is involved. The bus stations that serve routes around the region are located in Yelizovo and Petropavlovsk-Kamchatsky. Dogs are used instead of taxi in Esso. The bravest tourists take months for trekking, if they wish to explore everything by foot. Cooperation with local tour agencies will save time, but not money. Ethnic festival of the end of summer Alhalalalai (Алхалалалай). There are two types of day sightseeing you can participate in whilst in Kamchatka. The first can be reached by car and on foot and costs $80 max, the second involves traveling by helicopter and costs up to $900. There are a number of tour agencies operating these tours, so it is rather easy to find them and/or join a group of tourists. It is worth pre-booking the helicopter excursions due to their popularity during peak season. Be aware that excursions by helicopter are dependent on both weather and sufficient passengers, both of which are unpredictable. Typically Mi-8 helicopters are used, requiring about 20 passengers to be economically viable. The helicopters are about 25 years old, they are basic and rugged inside but generally feel safe. If you really want to go, allow for several spare days in Kamchatka. 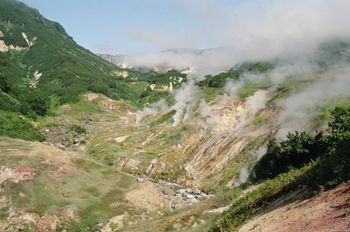 As of July 2011, the cost of excursions to Kurilskoye/Geysers was 24-27,000 Rubles payable in CASH (but remember - this is an experience of a lifetime!). This equates to about 3 hours of actual flying - about $5 per minute, comparable to helicopter rides elsewhere. Prices for the Summer season of 2016 are expected to be around 35,000-40,000 rubles on average for the most popular full day destinations such as Kuril Lake (36,000) or Valley of the Geysers (39,000). Kuril Lake (Kurilskoye Ozero) - Bear watching and Sockeye Salmon run/spawning (seasonal). Some shops accept credit cards, but acceptance is not widespread. Most Bankomats (ATMs) limit cash withdrawals to either 6,000 or 10,000 Rubles - note that some will levy a 2% fee in addition to whatever your own bank charges. As at July 2011 Rosbank, Gazprom Bank and Bank of Moscow did not levy a fee. Shaman, an ethnic store with a variety of memorable trinkets. 'Kamchatka Souvenirs', a department in GUM, the Central Supermarket offers pictures of artists, videos, wooden and bone carvings. Shamsa (Шамса) supermarkets are great for food and beverage. The deli section sells useful snacks such as piroshki, syrnicki etc. Credit cards accepted, although you may need to go through a specific check-out (at the Yelizovo branch, for example). Giant Kamchatka crab is delicious and about 1/20 the price if eaten in Kamchatka, compared to anywhere else. Many bottled waters are sparkling, or "with gas". If you want to avoid this, ask for "still" water or "byez gaza". A Rynok, or open market, is full of local produce and general supplies, including office supplies and clothing. The Pacific Plate is subducted beneath the Okhotsk plate just miles off Kamchatka's coast, and the peninsula is very geologically active. Two of the most powerful earthquakes on record shook the peninsula in 1737 and 1952 at ~9.3 and 9.0 magnitude, respectively. The latter caused a tsunami which ravaged Hawaii and even reached as far as New Zealand and Chile. In addition to these two megaquakes, powerful earthquakes occur quite often. A 6.0 magnitude earthquake occurs every 3-5 years with a 7.0 quake occurring every 10-15 years. Be sure to pack appropriate clothing when you're hiking up in the mountains, as the weather changes fast and temperatures can quickly fall. Warm clothing is recommended, as are sunglasses and suncream for when the skies are clear. Do not walk off the paths to the scree and snow slopes. Beware of bears, who sometimes wander into the city suburbs and are encountered regularly out in the wilderness. Do not leave food out, even small pieces and cans. Bears have an acute sense of smell, and once they've found human food somewhere they'll return to the place again and again. Making noise and talking is advisable while trekking, and bears will shun unusual and mostly loud sounds. Poisonous plants are rare but they exist. It may be possible to hitch a ride on a boat heading from Petropavlovsk-Kamchatsky to Severo-Kurilsk in the Kuril Islands of the Sakhalin Oblast. Visit Pimchakh, an Itelmen village 5 hours away from Petropavlovsk, if you are interested in ethnology. There is a couple of villages more. This page was last edited on 5 February 2019, at 07:20.